Aarsun woods brings offer you premium quality, luxuriously crafted Wooden beds, handmade using only the finest materials from specially selected sources. Their insights into the science of sleep have influenced their innovative designs, resulting in a collection of beds that are not just beautifully made. 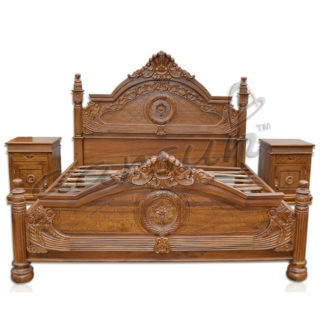 This Handcrafted wooden bed is made from teak / sheesham wood. Each item is made to order and we take great pride in our workmanship. We treat every item individually as a handmade bespoke piece, and we use only the finest materials and products. We use great attention to detail and can cater for special sizes. Our customers are very loyal and they have come to expect a consistent, high quality service from placing an order through manufacture to delivery. The wooden Bed has strong lines and a very simple dignity. It’s a bit of a classic, and works really beautifully with just about any styles of bedroom furniture. If you have it finished in our antique wax or oak lacquer, the bed’s solid headboard and foot-end give it a fine, rustic feel. If you go for dark mahogany lacquer or brown paint, however, it really accentuates the modernity of the styling. The other thing people love about this bed is that the foot-end drops almost to the floor, so you can slide our really useful under bed storage drawers under the bed without being able to see their sides from the foot end of the bed.